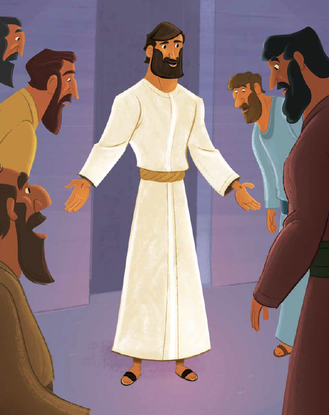 This week in The Gospel Project® for Kids, our journey takes us to Jesus’ appearance to the disciples in Luke 24:36-43; John 20:19-29; and Acts 1:3. Perhaps one of the most gracious things Jesus did after His resurrection was appear to the disciples, proving He was alive. The disciples were devastated to see that Jesus had died. How could He save them if He was dead? Even though Jesus had foretold His death and resurrection (Matt. 20:17-19), Jesus’ disciples believed by seeing. If Christ had remained dead, His death would have meant nothing more than yours or mine. Humanity would still be without hope. Jesus’ resurrection gives us hope that we one day too will be raised and changed. God gives us victory over death through Jesus. Emphasize to the kids you teach that Jesus is alive! Share with them that they have a special purpose: to tell others that Jesus is alive. He is reigning as King today over all of creation. What did Jesus do after he was raised from the dead?